The U.S. had been planning a show of force against Syrian troops since 2013. Russian experts are convinced that the surprise U.S. missile strike on a Syrian airbase, following accusations that President Assad used chemical weapons, will have a serious impact on U.S.-Russian relations. They offer several possible scenarios for the future, the most dangerous of which is a direct clash between Russian and American troops. Russian experts do not exclude the possibility that Moscow's response to Washington's attack on its Syrian ally will be a show of its own military force. In the event of another U.S. strike, Russia may decide to shoot down some of America's cruise missiles, said Alexei Fenenko, an expert at the RAS Institute of International Security Problems. For now, Moscow will demonstratively increase its military efforts in Syria. The U.S. had been planning a show of force against Syrian troops since 2013, which is why the early Friday morning attack can be considered the start of a new U.S. military adventure abroad. However, "sooner or later the logic of confrontation will force Russia to respond with force," added Fenenko. Moreover, a possible clash between the two superpowers does not necessarily have to assume the dimension of a global nuclear holocaust. It can resemble the events of the Spanish Civil War in 1936-1939 when Soviet aviation fought the armies of Fascist Italy and Nazi Germany without a formal declaration of war. At the same time, we cannot fully exclude the use of nuclear weapons in this proxy war. The militaries of both countries reserve themselves the right to use tactical nuclear weapons, warned Fenenko. 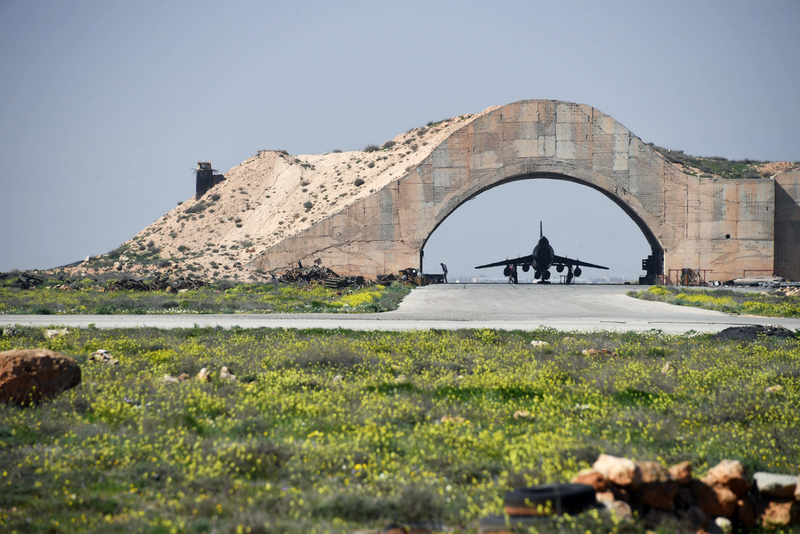 Experts noted that the U.S. conducted its strike without consulting Russia, and not taking into consideration how the bombing may influence the situation inside Syria and future relations between Washington and Moscow. International relations expert at the Higher School of Economics, Dmitri Suslov, said this attack means that Donald Trump's team "will carry out a policy of harsh unilateralism with the use of military force in disregard of international law, basically becoming a light version of the Bush Jr. administration." Having changed its approach to the Syrian leader in just an instant, Washington will again seek to obtain his removal. But Russia does not plan to surrender its ally and will increase its military presence in Syria. In turn, the U.S. is unlikely to retreat because Trump's main goal now is "not to appear weak, but to demonstrate strength." In such conditions, a serious military-political escalation in Russian-American relations in Syria is very probable. Suslov does not exclude the possibility that this situation may become "a repeat of the tensions" of the Cuban Missile Crisis, when 55 years ago the two superpowers were on the brink of a nuclear war after the Soviet Union deployed its missiles to Cuba. Back then, however, war was avoided when Moscow withdrew its missiles from the "Island of Freedom" and Washington withdrew its missiles from Turkey. Not all experts, however, believe Russia is preparing some kind of military response for the U.S. in Syria. Alexander Konovalov, president of the independent Institute of Strategic Evaluations, said that Moscow will limit itself to what it has already done: withdrawal from the memorandum on flight safety with the American military. Russia will not expand its military presence in the country since "the U.S. did not start a war in Syria but, as it stated, conducted a single operation," said Konovalov. In any case, Russia will appeal to international institutions, raise the issue of American aggression against Syria at the UN Security Council and will speak with Washington on investigating the use of chemical weapons in Syria. However, the question remains: how will the U.S. respond to these Russian efforts? Vladimir Sotnikov at the RAS Institute of Middle East Studies remarked that the two countries' relations now depends on U.S. Secretary of State Rex Tillerson's visit to Moscow. He will have a "delicate mission." "On one hand, Tillerson will have to explain Trump's decision (to carry out an airstrike on Syria), on the other hand, he will have to maintain relations with Moscow," said Sotnikov, emphasizing that the U.S. needs Russia to solve the Syrian crisis. Washington will have to find common ground with Moscow in Syria.